A Homeland Security official would only confirm that out of an “abundance of caution,” it regularly shares “relevant information with domestic and international partners,” such as those handling the games in Sochi. Recent suicide bombings in Russian cities and several threats from terrorist groups have raised concerns about security in Sochi. The city is also about 300 miles away from the North Caucasus, where Russia has been battling Islamic militants. 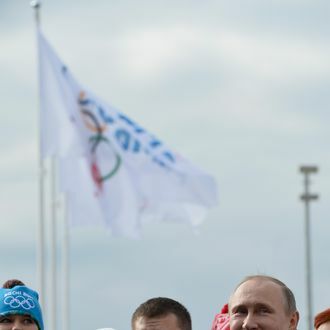 Forty thousand police and special services officers are being deployed to protect the games, and President Vladimir Putin said on Wednesday that intelligence agencies from several countries will be working together day and night at the Sochi Olympics security headquarters. Unsurprisingly, Rep. Peter King, chairman of the House Homeland Security Committee’s subcommittee on terrorism and Intelligence, was far less reassuring. He told CNN that American in Sochi are “reasonably safe,” but he wouldn’t go to the games himself. “Just as a spectator, I don’t think it’s worth the risk,” he said. “I mean, odds are nothing is going to happen, but the odds are higher than for any other Olympics, I believe, that something could happen.” It seems hideous Team USA sweaters are the least of America’s concerns.